Only a few days ago, we described Dennis Huddleston as the “very model of consistency” for the regularity and consistently high quality of his 36 output. Much the same could be said of Max Corbacho, who’s been crafting ambient-electronic soundscapes since 1998. 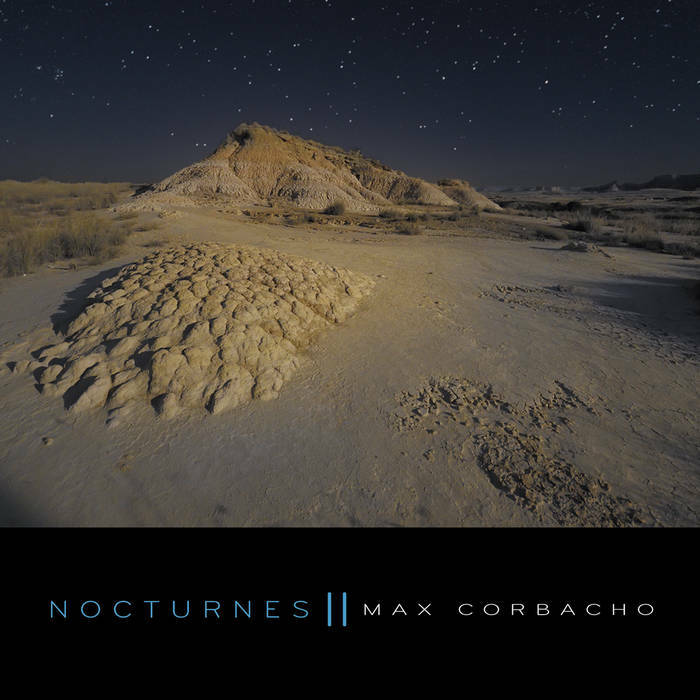 This second chapter in his projected Nocturnes trilogy certainly lives up to its title, its seventy minutes evocative of the unsettling stillness that sets in during the deepest hours of the night. Working with sequencers, synthesizers, samplers, and looping devices, the Barcelona-based producer spent three years bringing Nocturnes II to completion. In the opening “Celistia,” one of two epics pushing past the twenty-minute mark, Corbacho couples drifting synthesizer washes with the quiet chirp of crickets to leave no doubt as to the time of day in question. Suggesting winds blowing across open fields, slow-motion whooshes accompany those washes to reinforce the image of a barren landscape, while the soft murmur of other creatures embroiders the crickets’ song with additional layers. As much as the seven parts constitute an integrated whole, there are noticeable differences between them. “Starlight Grace” replicates the glacial unfurl of “Celistia,” though in this case the focus shifts from terra firma to the heavens, the move intimated by a greater emphasis on radiant textures that sparkle and shimmer in equal measure. “Heart of the Night” by comparison exudes the unsettling quality of a nightmare, if one more subtly disturbing than outright harrowing, while the second long-form soundscape, “Moon Apparition,” caps the release with one final deep space music plunge, even if the crickets’ return suggests the experience is originating from an earthly vantage point. As he’s done on previous releases, Corbacho demonstrates here an undeniable talent for crafting expansive, luminous soundscapes. His music unfolds with patient deliberation, and the control he exercises in weaving his elements together is never less than impressive. Movements seem to generally slow down during the night hours, a phenomenon effectively conveyed by the recording’s serene, mystery-laden meditations.